During the Congressional hearings regarding the scandal of the IRS and the Conservative 501C3 applications, we heard the IRS Inspector justifiably refuse to answer questions because it is against the law to share information about a tax document under consideration. Today we learned that disgraced IRS employee Lois Lerner shared some of the documents from conservative groups with enforcement attorneys at the Federal Election Commission, possibly committing a felony. According to the email chain that Judicial Watch has unearthed via FOIA requests, Lerner continued that behavior at the IRS. Judicial Watch announced today that it has obtained email exchanges between former Internal Revenue Services (IRS) Director of Exempt Organizations Lois Lerner and enforcement attorneys at the Federal Election Commission (FEC) indicating that the IRS provided detailed, confidential information concerning the tax exempt application status and returns of conservative groups to the FEC in violation of federal law. Included with the email exchanges were IRS questionnaires to a conservative group that contained questions of a hostile nature. 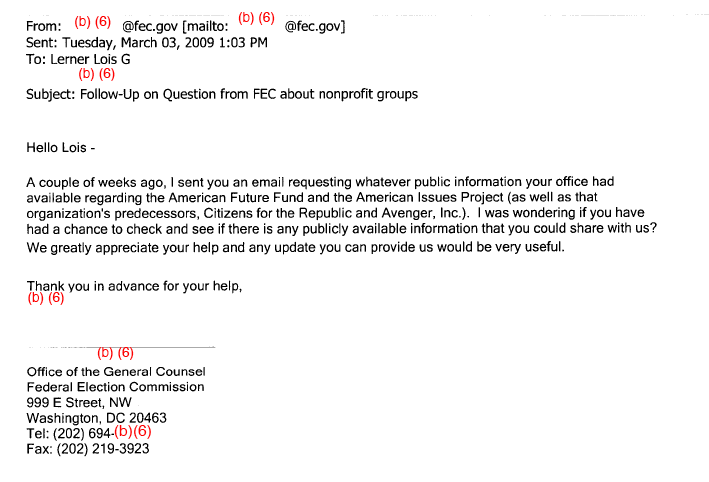 The email chain begins with a February 3, 2009, email from a FEC attorney (name redacted) asking Lerner if the IRS had issued an exemption letter for American Future Fund (AFF). 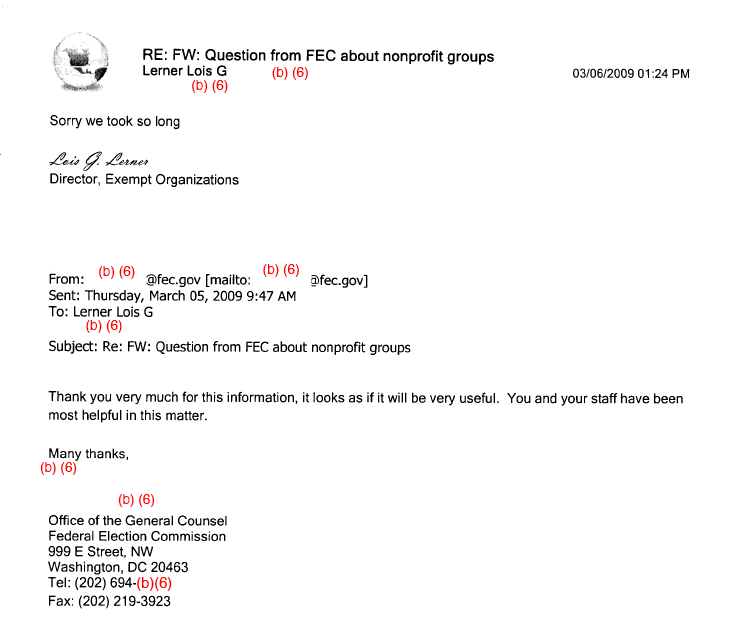 The writer of the letter notes, “When we spoke last July, you told us that the American Future Fund had not received an exemption letter from the IRS.” In the same email, the FEC attorney asked Lerner if she could also advise him if the IRS had granted an exemption letter to American Issues Project (AIP) as well as to AIP’s predecessor organizations, Citizens for the Republic (CFTR) and Avenger, Inc. (AIP). 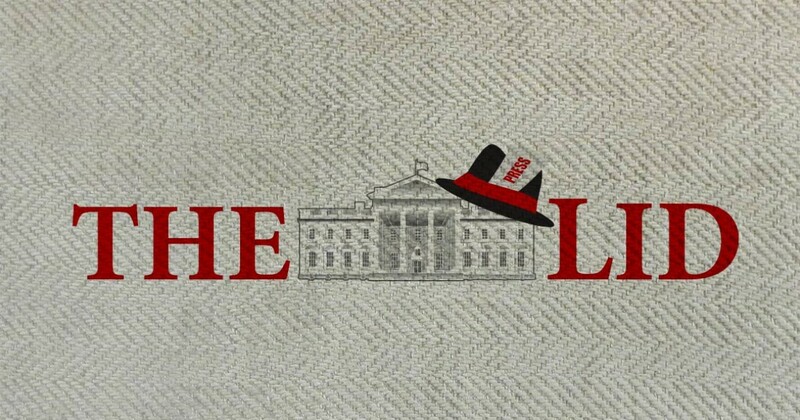 Most of the emails reveal that the IRS files sent from Lerner to the FEC containing detailed, confidential information about the organizations. These include annual tax returns (Forms 990) and request for exempt recognition forms (Form 1024), Articles of Organization and other corporate documents, and correspondence between the nonprofit organizations and the IRS. Under Section 6013 of the Internal Revenue Code, it is a felony for an IRS official to disclose either “return information” or “taxpayer return information,” even to another government agency. These emails confirm what many people already suspected, Lerner illegally shared confidential information for purely political purposes. This also brings the FEC into the scandal which threatens expose the White House’s abuse of federal government agencies for his selfish political purposes.